Latest Updates: Added links and new My Inbox sub apps available as of SAP S/4HANA 1809, and updated link to the FES Deployment Recommendations. Note that embedded and hub are possible for S/4HANA so please check the specifics – the configuration steps are the same in both scenarios. While activating most Fiori apps in S/4HANA is a simple matter of activating the app’s ICF node and OData Service(s) on the Fiori Frontend Server, Fiori My Inbox is something of a special case that requires more explanation. Much of this is similar to Fiori My Inbox on predecessor platforms, but there are some special additions with the introduction of S/4HANA 1610. This blog explains how to configure Fiori My Inbox. In the next blog we look at the extensibility options that come with My Inbox as of S/4HANA 1610. So you want to activate Fiori My Inbox on S/4HANA 1610 or above? Of course you do! 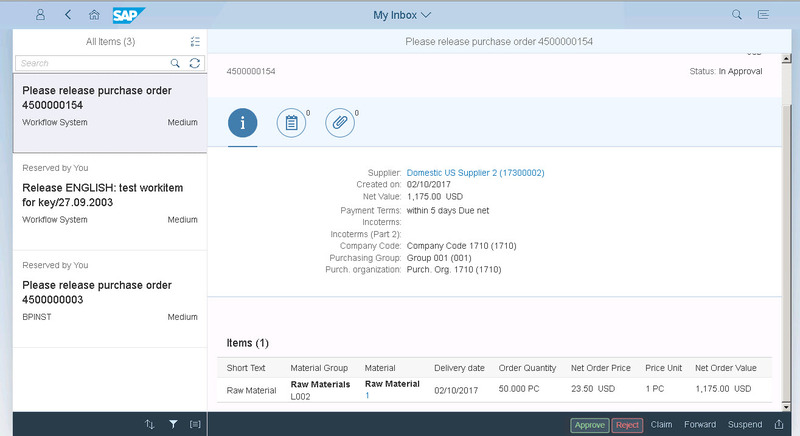 It’s arguably the most requested app in the entire Fiori Apps Library. Of course, if you’ve activated Fiori My Inbox before on Business Suite, Suite on HANA or S/4HANA 1511 you may think you’ve seen it all before. But don’t be misled – S/4HANA 1610 and above provides some additional options worth knowing. And even if you have done this before, it’s easy to miss some of the recent improvements. Tip: Some of the basics we need is covered in the SAP S/4 HANA Fiori Apps Deployment (MAD) guide in the section “Additional App-Specific Configuration for Manager-Role Transactional Applications (optional)”. If you are not sure where to find the guides, you’ll find it in blog Leading S/4HANA UX – Getting the Good Guides. Tip: Some of the extension options are also covered in more depth in the Fiori My Inbox wiki. 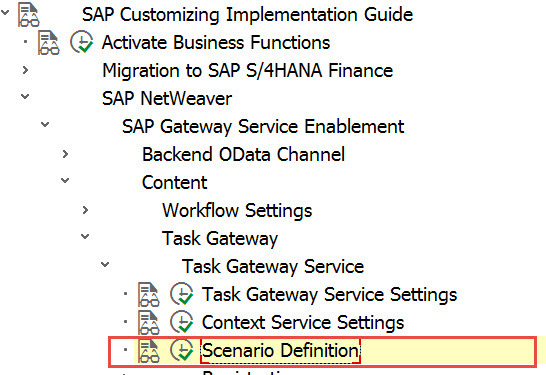 Note: Check the FES Deployment Recommendations for S/4HANA to confirm which one applies to your scenario. We will use SAP Business Workflow examples in this blog as that is the more common scenario for customers transitioning to S/4HANA from predecessor SAP platforms, and is currently the default workflow environment provided in the S/4HANA core server. SAP delivers Fiori My Inbox with 2 workflow providers: SAP Business Workflow and BPM. In the S/4HANA Core server, our workflow environment is activated for runtime usage. We can check this in transaction SWU3. In the S/4HANA Core server, one or more workflows must be active. It’s a good idea to check that all the workflows in scope are active. We can check whether the workflow id is active in transaction SWETYPV, i.e. the Type Linkage Activate checkbox is checked. In the S/4HANA Core server, one or more work items has been created and assigned to a workflow agent, our test user id. We can check this in transaction SWI1. 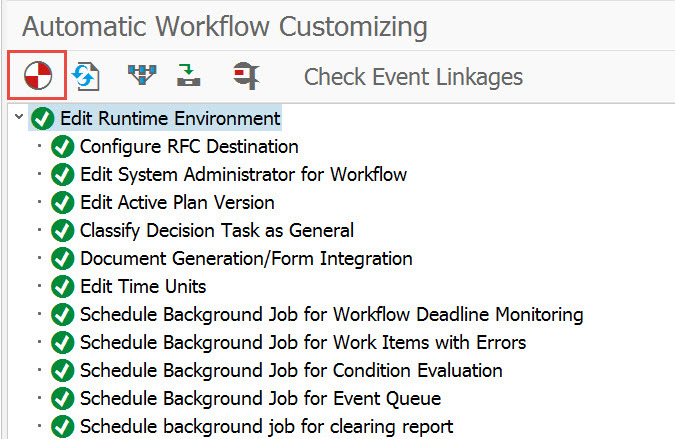 Once again it’s good to check the documentation and SAP Notes for hints on what’s needed to assign workflow agents to the workflows in scope. If you are using Best Practice Guides also check the Best Practice Guide for that functional scope area. We should also check that the Fiori My Inbox modules are installed on the Fiori Frontend Server and S/4HANA Core Server. Even though these are part of the standard S/4HANA install, we should confirm the support packs versions installed, as one of our first steps is to make sure that the My Inbox installation is in the best possible state. VERY IMPORTANT: Fiori My Inbox is arguably the most requested, most used, and therefore most tested Fiori apps in the entire Fiori Apps Library. There is no business value in rediscovering issues that have already been discovered and resolved by other customers. So before we begin configuration we should check the Fiori Apps Library and the SAP Support Launchpad to find and apply the latest support notes for Fiori My Inbox relevant to our landscape. The version of Fiori My Inbox used in S/4HANA is Fiori My Inbox 2.0. IMPORTANT: It is important when configuring that only Fiori My Inbox version 2.0 requirements are applied. Activating older versions can interfere and cause unpredictable behaviours in My Inbox. There is also a specific software installation module for My Inbox UIX01CA1 that is applied to the Fiori Frontend Server. This module holds the Fiori My Inbox User Interfaces themselves. This is the first of the S/4HANA 1610 specifics. With S/4HANA 1610 a number of sub apps are delivered for Fiori My Inbox. These sub apps provide delivered task-specific detail displays for standard workflows. Even if you aren’t using a standard workflow, these are great as a starting point for your own task-specific extensions. While you can’t use Cloud-only sub apps directly in an S/4HANA On Premise system, they can be a starting point for ideas for your own custom task-specific extensions. Under the covers, Fiori My Inbox uses the SAP Gateway “Task Gateway” services to gather, present and action work. In our example we will focus on a single S/4HANA Core system as this is the default scenario for most customers. However it is worth noting that we can use Fiori My Inbox to show multiple work items from multiple workflow providers hosted in multiple systems. It’s important to understand this multi-provider approach, as it drives much of the configuration and extension approaches for Fiori My Inbox. For example we might have a S/4HANA core with a BPM system and an older SRM server in our landscape, and want to bring all work items in one place. Fiori My Inbox needs to be able to extract work items from multiple providers. To do this My Inbox needs not just a System Alias and RFC Destination, it needs to know the system id and client to be used for the task gateway service itself. As the Task Gateway runs in the Fiori Frontend Server, this System Alias is created in the Fiori Frontend Server and points to the S/4HANA Core, i.e. to the workflow provider. 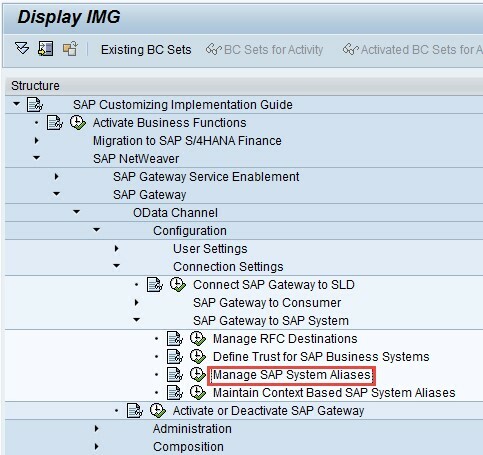 Instructions for Creating a System Alias for the Task Gateway can be found in the SAP Gateway 2.0 Documentation. As usual these details can be found in the Fiori Apps Library. The ICF node is /sap/bc/ui5_ui5/sap/ca_fiori_inbox and can be activated using the Task Manager (transaction STC01) with task list SAP_BASIS_ACTIVATE_ICF_NODES in the same way we activate the ICF node for any other Fiori App. The main difference to other Fiori Apps comes when we activate the OData Service which is /IWPGW/TASKPROCESSING version 002. Like other Fiori Apps we can activate this using the Task Manager (transaction STC01) with task list SAP_GATEWAY_ACTIVATE_ODATA_SERV. However we need to be especially careful to use the _PGW system alias, i.e. do NOT use the usual system alias with suffix _RFC that is used for other Fiori Apps. The reason for the _PGW system alias is to assign the OData Service to the special Task Gateway services for work item extraction. Sub apps often have their own OData Services which need to be activated. Again, it’s best to check the app’s documentation in the Fiori Apps Library and S/4HANA Product Assistance. Depending on which task-specific configuration is being used, the S/4HANA Core system may need to build launch URLs and other details required to be passed back to the Task Gateway services. To facilitate this we need a system alias that points back to the S/4HANA Core system and it needs to be marked with the system id and client. Which options to provide is both a business process and a user experience decision. SAP delivers both options and it’s possible to provide both options in parallel as part of a user’s Launchpad – just make sure the tile descriptions are clear to avoid confusion. Don’t forget that it’s not just managers and other approvers who need My Inbox. If we want employees to respond to a rejected request then that may be done via My Inbox as well. It all comes down to which tasks we want to provide to which users as work items. It’s also worth discussing whether these users typically in a single business role or more likely to be in multiple business roles. Where users frequently handle multiple business roles they are typically more likely to want all their work in one inbox. There’s also a best of both worlds option. When we give users the All Items tile, we also have the option to authorize them to create and save their own filter combinations to their Launchpad. Whether we are using an All Items or Scenario specific Inbox depends on the parameters for the Tile in the Tile Catalog. If we do want to configure a scenario specific inbox, we need to know what tasks to include for what workflows in our scenario. These are often provided as part of the S/4HANA documentation. The next example shows the exactly matching Scenario Definition configuration for the Scenario ID EHS_HS_HAZMAT. In the Task Definition of the Scenario we list the Task Ids that are included in the Scenario. In part 2, we look at the Task-specific Configuration and Extension Options for S/4HANA. service /sap/bc/ui5_ui5/sap/ca_fiori_inbox in SICF. please suggest if we have to do any config. Blog comments is not the correct place to ask questions – especially about specific config. Thanks Jocelyn. it is more informative.